Action Pilot's green weapons tree included a parachute pack, a pistol and a rifle. A white helmet, air black mask, white parachute and a black strap were also included in the package. Action Pilot was first sold individually boxed (above, in yellow). 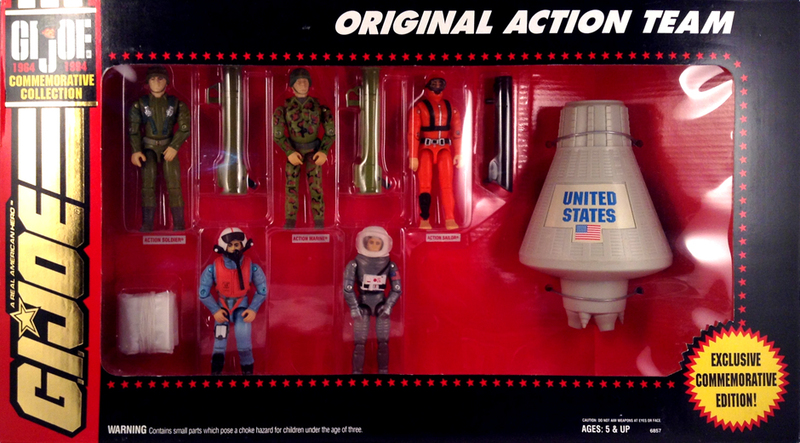 He was later sold in the Original Action Team boxed set (below, in blue). The accessories for both 1994 Action Pilots (v1 and v2) were identical. Here you see the white parachute loaded into the green backpack.